Interserver Review: Unlimited Storage and Transfer But Is it High Quality Hosting? Looking for affordable web hosting and top-notch customer service? Read our review of InterServer before making your choice. InterServer is an affordable, full-service web hosting provider that offers a distinctive emphasis on high-quality customer service provided via multiple channels 24/7, 365 days a year. With InterServer you’ll find a variety of hosting options to choose from, including shared, VPS, and dedicated plans, as well as colocation services if you prefer to own your physical infrastructure. All of InterServer’s plans come with an extensive suite of features that make creating and maintaining your website and an online presence easy. What Type of Hosting is Offered? What’s the Quality of InterServer’s Customer Support? Is Their Support Team In-House? What are Their Billing and Cancellation Policies? No Free Trials, but . . .
What are the Benefits of the Price-Lock Guarantee? What is the Price-Lock Guarantee from InterServer? Does InterServer offer a money back guarantee? Does InterServer offer an uptime-guarantee? Does Interserver off free domains? 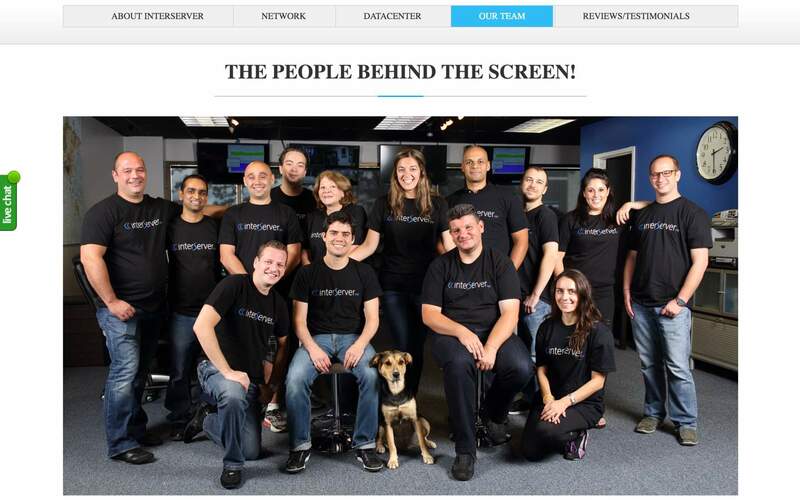 InterServer is a Secaucus, New Jersey-based company founded in 1999. Initially, InterServer focused on reselling web hosting plans. While this still forms a small part of their business, they’ve since grown to the point where their focus is on web hosting. Their clients range from single-owner, small businesses to Fortune 500 companies. Today, InterServer does everything related to their hosting business in-house, including building their servers, developing their nationwide fiber-optic network (yes, they dig up dirt and lay the lines themselves), and customizing their Linux kernels. They use top-quality hardware, and they pride themselves on their redundancy and underutilizing resources to ensure optimal performance and uptime for you, no matter which web hosting plan you end up choosing. InterServer has four datacenters in the United States, offering excellent coverage for customers in North America. To support a sturdy current client load, InterServer operates four datacenters, three in New Jersey, and one in California. Their facilities are heavily secured, with biometric entry points, redundant power, and HVAC units, and raised flooring to protect servers in the event of water damage. Such features allow InterServer to promise 99.9% uptime and 100% power uptime. The datacenters are staffed by specialists as well as security guards 24/7, 365 days a year. InterServer prides themselves on their excellent customer service, and one of the ways they ensure this is by imposing a daily signup limit. The company typically restricts the number of daily subscriptions to 100. The limit is to ensure that the company can meet the needs of existing customers and new users. Keep this in mind if you are coordinating a project launch and want to use InterServer. InterServer offers unique deals to their prospective clients. One of the biggest perks when using InterServer is its price guarantee: the amount you agree to when signing up is the price you’ll continue to pay during the lifetime of that contract. As long as you don’t make any adjustments to your plan (for example, scale up from VPS to dedicated hosting), you can expect to see steady fees for your web hosting needs. All InterServer plans come with a 99.9% uptime guarantee. Like every other web hosting service, shared plans are the cheapest, followed by VPS, dedicated, and finally, their colocation plans. However, InterServer offers different “levels” within each plan so that you can choose and pay only for the resources that you need. This means that you’ll occasionally see lower-tiered plans costing more than higher-tiered plans. For example, a plan at the upper end of the VPS pricing spectrum might cost more than a dedicated hosting plan at the lower end. Two of the most popular types of hosting offered by Interserver are Cloud Hosting and VPS Hosting. Below we will take a look at what each type of hosting means for your business. VPS Hosting is one of the most popular hosting solutions available on the market today. It is made available to customers by Interserver, Bluehost, and other top hosting providers. VPS (Virtual Private Server) hosting occurs when a large server is divided into a number of smaller virtual servers which each act as an independent environment. It may sound similar to shared hosting, but with VPS Hosting you have a set amount of resource dedicated to your needs. Cloud hosting is a good choice for small businesses that may need to scale up quickly and easily. That may be due to anticipated fast growth or to accommodate sudden large spikes in traffic coming from your marketing campaigns. Cloud hosting means that data is stored across a number of different web servers ‘in the cloud’ rather than on a single shared or dedicated server. InterServer offers five different reseller web hosting packages. The primary difference between the packages is the amount of disk space allotted and the maximum amount of bandwidth you and your affiliates can use. Regardless of which package you choose, you get Web Host Manager for client management, unlimited domains, access to one-click scripts, and MySQL databases running on solid state drives. You can set up your account instantly, and InterServer takes care of all backups for you on a daily basis. If you’re opting for a basic, shared hosting plan, you can choose from three options. All include unlimited storage, transfer, and e-mail. The standard and WordPress plans come with free SSL certificates as well. WordPress: This plan is for you if you’re looking for a plan to host your WordPress site. It is similar to the other shared plans but includes features such as version control, anti-virus protection, and daily backups. Note that you can host your WordPress site using the other shared plans at a lower cost. Easy one-click install for 381 programs including WordPress, Drupal, and Magento. They also make it very easy to upgrade to VPS/dedicated hosting as you grow. They also promise that there won’t be any downtime for your site during the transition. InterServer also supports SSH and Cron jobs. Full root access: you can install and customize any software you need to optimize your hosting experience. Because the assumption is that you’ll be doing a fair amount (if not all) the work required to maintain your slice, InterServer charges for things like a GUI-based control panel, backing up, and taking snapshots of VPS. The limit on this is they support only operating system-related issues and anything installed by a control panel purchased from InterServer, so you’re on your own with regards to third-party applications. You do have full root access, though, so you can customize your server with any Linux-based application or component. InterServer offers many avenues of support. InterServer’s dedicated plans offer top-notch performance, highest levels of reliability, and support heavy traffic. The servers support applications/operating systems that do not support virtualization. Additionally, since you’re in full control of the software running on your server, you can choose any flavor of Linux, Unix, or Windows for your operating system. Whether you want a GUI-based control panel and if so, which one. InterServer offers what they call “Quick Servers,” which fall under the dedicated hosting plan umbrella. They are fully dedicated servers running KVM virtualization and offer a twenty-minute setup time. You get access to the server to reboot, reinstall software, and out-of-band console access, while InterServer manages the hardware. Essentially, this is a like a VPS plan but with the power and functionality of a dedicated hosting option. There are further options to support your complex hosting needs. Pricing varies, and you can get additional information from their support team. The usual process of signing up for an enterprise plan involves you getting a customized quote. Plans of this magnitude can have very specific requirements, hence the workflow. If you want the flexibility, power, and performance of a dedicated server while also having control over your physical infrastructure, InterServer offers colocation plans. Plans at the low end get you a single server, while plans at the high end include a full, closed cabinet. In addition to the typical benefits that come with colocation plans, such as affordable access to high levels of bandwidth and power security, you are allowed 24/7 access to your resources and a prime location in one of InterServer’s New Jersey datacenters. InterServer promises that they can get you up and running within three days. They offer month-to-month contracts with a 30-day money back guarantee. Colocation packages are the only ones where you can purchase system administration services. They are available in blocks of 15-minute-long intervals. 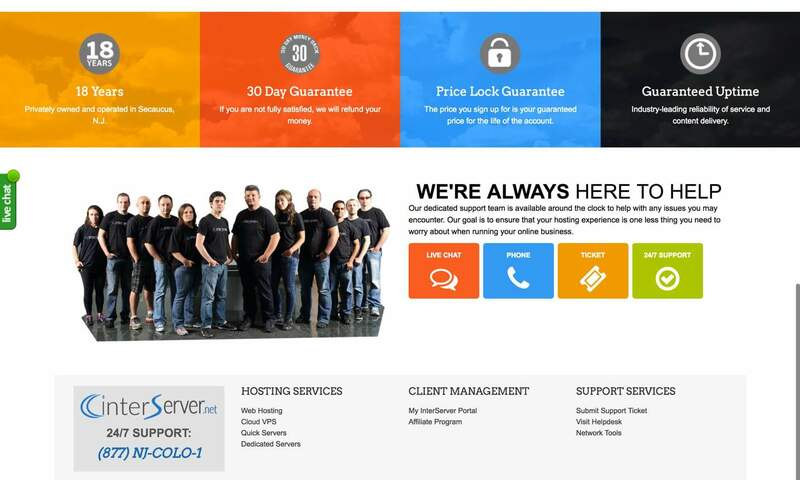 InterServer has a strong customer support program, reflected in numerous positive testimonials. Many users say they switched to InterServer simply because they wanted the guarantee of excellent support. The team is active 24/7 all year round to answer your questions. In line with their promise to make everything as straightforward and easy as possible for their users, InterServer maintains a simple pricing scheme. The more features you want to include your hosting package, the more the plan will cost. However, once you and InterServer agree on a monthly fee for the package, that is the price you pay for the entire time you have an active hosting package. Unfortunately, InterServer does not offer any free trials. However, because they bill their clients on a month-to-month basis with no long-term contract required, you can easily cancel at any time if you are unsatisfied. You can also take advantage of their 30-day money back guarantee, so you won’t be out any money if you cancel your plan within the first month. Aside from regular hosting plans, there are also a number of other features provided by Interserver that sets them apart from competitors. One of the greatest benefits of choosing Interserver hosting for your business has to be the company’s ‘price lock guarantee’. The price lock guarantee means that the monthly fee that you agree on when signing up for Interserver will be the same fee you pay for your entire time as a customer. In short, it means that you will never need to worry about a hosting price rise ever again. A Content Delivery Network is a group of servers dotted around the world that works together to provide faster delivery of internet content to users around the planet. CDN services can be free or paid-for. One popular example of a free CDN service is the Cloudflare CDN which can be combined with many hosting services such as InterServer or Bluehost. CDNs serve your website to users from a node that’s geographically closest to them. This means they get the highest possible site loading speed. The speed of site loading is critical for small businesses. Research shows that for every additional second that your site takes to load you lose a significant percentage of potential customers. This is because browsers are used to best-in-class experiences and will leave your site in impatience if it takes too long to load. One of the key benefits of using a CDN service is security. The CDN acts as a sort of security fence against DDoS attacks and hacking attempts. A CDN service ensures that your website has 100% availability even during power outages. This can also protect you against lost sales that might otherwise occur in such a scenario. One CDN service will eliminate the need to pay for foreign servers around the world and thus will save your business some serious cash. A CDN service allows you to see where your customers are from and which region is more popular for your business. ASP.NET is a framework designed by Microsoft to enable web developers to design websites, applications, and web services. Because it used a templated approach, it allows for the speedy development of business applications. Many businesses have legacy applications built in ASP.NET. This framework has specific technical and security requirements in a host. ASP.NET hosting is designed to meet those requirements. There is also a newer version of the ASP.NET framework known as ASP.NET MVC which is also popular among developers. The “MVC” refers to “Model – View – Controller,” which is a model which separates the business logic, input, and presentation (visual interface) aspects of an application. This also speeds development up. The Dell, Ancestry.com, and Taco Bell sites are built on ASP.NET MVC. However, these technicalities are rarely of concern to you as a business owner and are usually handled by web developers. InterServer’s strengths include offering full-featured packages at a variety of very affordable price points. These are backed by a 30-day money back guarantee, monthly contracts so that you can leave if your needs ever change, and excellent customer support. Additionally, InterServer offers a range of plans, so you can scale up and down as needed. Not only could you move from a shared plan to a VPS plan (or from a VPS plan to a dedicated plan), all with no site downtime, you can move within a plan. For example, if you’ve opted for VPS hosting, you can add what InterServer calls “slices,” using your control panel; you do not have to consult with the InterServer team directly. This flexibility allows you to pay for just what you need, and potentially, you could host your site with InterServer no matter how large your business grows. Keep in mind, however, that InterServer’s hosting packages, which we can consider full-featured, may not include extras that other providers might. For example, there’s no uptime guarantee if you choose a shared plan, and InterServer charges for the addition of a cPanel with your VPS or dedicated hosting solution. This is fine if you’re entirely comfortable with using the command line to manage your servers, but if you prefer a GUI-based control panel, the extra cost is something you’ll want to take into consideration. There are limitations associated with each of the packages, so be sure to consult the documentation and contracts to ensure that you get what you think you’re paying for. Furthermore, while InterServer provides some managed solutions, be aware that you will have to do most of the legwork regarding maintaining your VPS or dedicated servers. While these are low-cost plans, if you need to switch to one of them due to a significant increase in traffic, the savings might be offset by the need to hire a system administrator. Now that you have a good idea of what Interserver has to offer, you might want to head over to our sister site, WhoIsHostingThis.com where you will find a couple hundred reviews from actual Interserver customers. They’ll give you a whole new perspective. Any instant queries floating in your mind? Take a look at the below answers to some frequently asked questions. The Price Lock guarantee means your hosting prices are locked in for life. Meaning your hosting prices will never increase if you stay on the same plan. No, there is no money back guarantee. However, they do offer month-to-month billing which is fairly unique in the hosting industry. You can cancel at any time. InterServer offers and 99.9 uptime guarantee, which is fairly standard. They do not offer free domains, but they do offer discounted prices. You can get a domain added to a hosting package for $1.99. You are here: Home > Web Hosting: Which Hosting Company Is Best For You & Your Website? > Interserver Review: They Say ‘Unlimited Hosting’. We Decided to Test This Host’s REAL Limits. Our Verdict: An easily scalable, seasoned host.